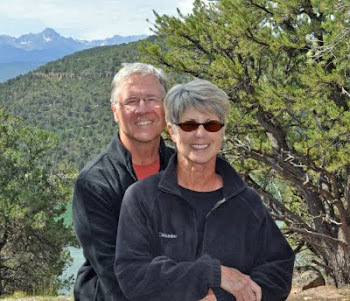 Find us on Google+ Rick and JoAnne's RV Travels: June 26, 2009 Heading for them cooler hills!!! June 26 – We left Milford and drove to Goodland, Kansas and stayed overnight at the very nice KOA. Big storms had been surrounding us and we thought this “would be the night” – but we escaped the storm and were treated to a beautiful rainbow. We had such a wonderful visit with Maggie, Jeff and the kids, and even with the oppressive heat and humidity - as always we relied on our adage “we can’t control the weather” and had a fantastic, fun adventure and are looking forward to a cooler Colorado!